Spoken word meets the ivory as Eric Mingus joins forces with David Amram, Larry Simon and an assortment of session musicians. 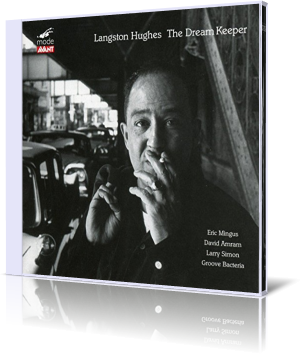 Langston Hughes: The Dream Keeper (Mode Records, 2017) presents the American poet/novelist/activist/playwright’s words in musical form. Mingus speaks briefly to start “The Dreamer.” The organ steps in, followed by other instruments, creating a haunting soundscape. After the instruments set the mood, Mingus recites again. “Bring me all your dreams,” he says. Davis’ contra-alto emerges for a meandering solo. Chatis follows and closes out the track. “In Time of Silver Rain” is the most swinging title, with the musicians playing an upbeat soundtrack. After Mingus completes the poem, Davis cuts loose on the alto sax, interrupted briefly by the organ. The set closes with a Mingus/Amram duet, “Life is Fine.” Mingus begins singing the lyrics. When he goes to spoken word, it’s part poetic, part sermon. Some of the tracks are dark musically, reflective of the theme of the poems recited by Mingus. Six of the 12 tracks feature only Mingus and Amram. The project came from Simon, who is co-founder of JazzMouth, a festival in Porstmouth, New Hampshire that features jazz, spontaneous music and readings by poets. Hughes’ poetry is topical for almost any era, even today. His words have inspired many musicians, including several jazz artists. Mingus is son of Charles Mingus. He spent several years as session musician and background vocalist, having performed with Bobby McFerrin and others. Other notable associations include the Charles Mingus Big Band, Todd Rundgren, Elvis Costello and Leon Helm.